Our land-based ecology services cover a broad range of habitats and species within the context of wildlife legislation and policy. 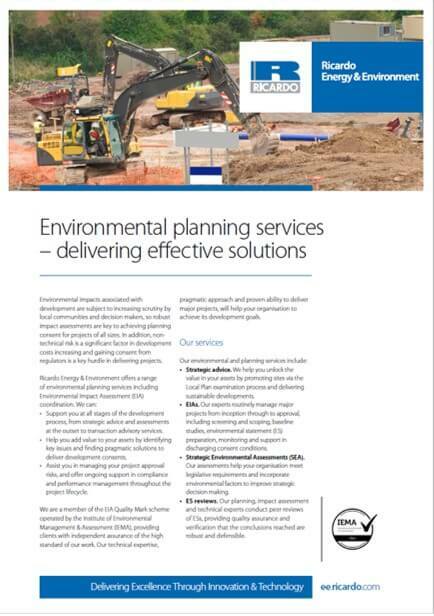 Wherever your organisation’s activities have potential to affect the ground, vegetation or built structures that support notable species, we have the knowledge and experience to help you avoid or manage such impacts to achieve your aims in a responsible and legally-compliant way. 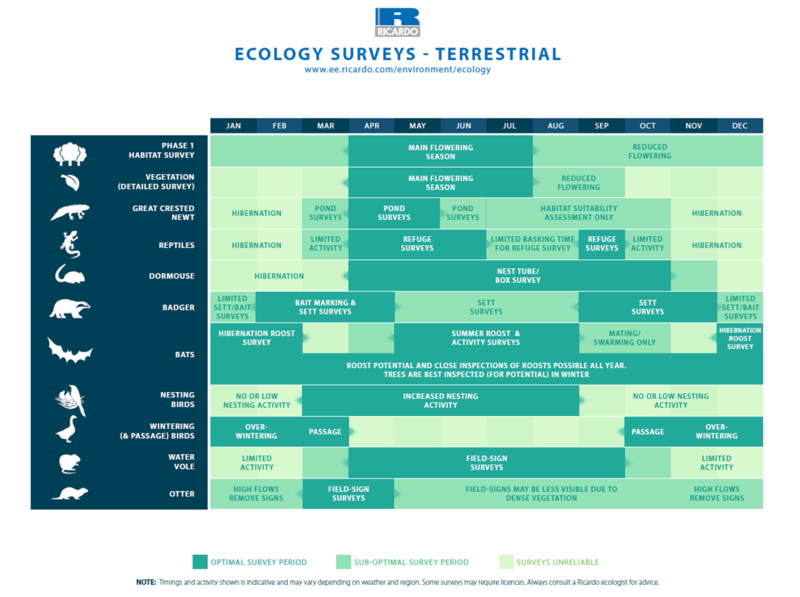 We are pleased to provide the Ricardo Ecological Surveys Calendar , which covers most surveys in both terrestrial and aquatic environments. Click here to download the calendar for free. Extended Phase 1 habitat surveys. Bat roost potential assessments of trees and buildings. Habitat Suitability Index assessments for great crested newts. Hedgerow surveys in accordance with the Hedgerow Regulations 1997. National Vegetation Classification surveys and analysis of data using proprietary software. Our ecologists hold a wide range of protected species survey licences, and many are highly-regarded specialists in their field. Reptile habitat enhancement, translocation and displacement. Nesting bird displacement (that is, installing measures to discourage bird nesting prior to the start of the breeding bird season), avoidance measures and habitat enhancement. Design of detailed management plans to maintain or enhance the biodiversity of a development site or adjacent area. 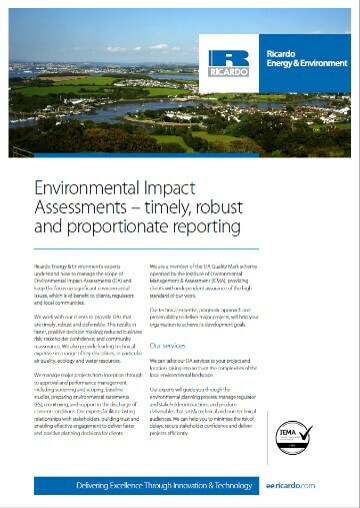 Our support is fully informed by recent best-practice guidance (notably CIEEM guidance) and we have experts who are preparing ecological impact assessments (EcIA) for formal and informal environmental impact assessments (EIA) and strategic environmental assessments (SEA). The team has a wide range of habitat and species specialisms, and a robust understanding of wildlife legislation and government policy. 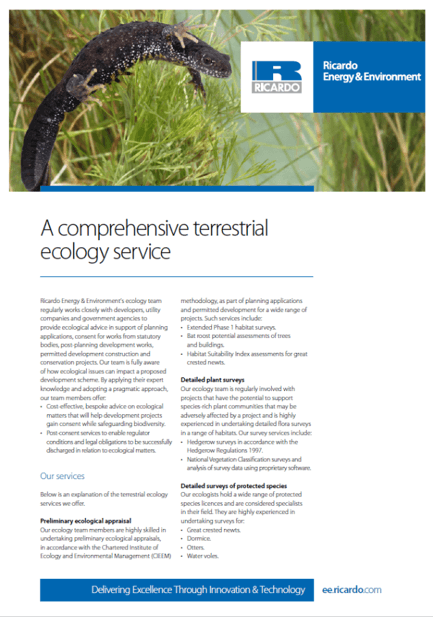 We are able to deliver all stages of ecological impact assessments, including screening, scoping, full assessment and mitigation design. In addition, we have experience in conducting all stages of Habitat Regulations assessments from initial screening through to informing full appropriate assessment, to consideration of imperative reasons of overriding public interest (IROPI) and associated compensation strategies. In addition to the above, our team provides expert Ecological Clerk of Works (ECoW) services for projects that require the provision of toolbox talks and/or onsite supervision to enable works to proceed without contravening relevant wildlife legislation. 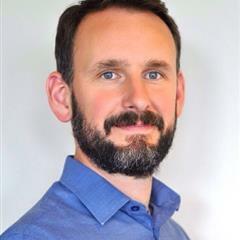 We are very experienced in helping clients to develop strategic plans and policies, and preparing and delivering associated formal guidance. From the writing of biodiversity strategies, to the development of site conservation management plans, our team brings an enviable breadth and depth of ecological knowledge and communication skill to such projects. We also provide bespoke training to organisations to help raise ecological awareness and reduce operational risks.